Usually, you think of solid state storage as faster than a rotating hard drive. However, in the case of the Raspberry Pi, the solid state “disk drive” is a memory card that uses a serial interface. So while a 7200 RPM SATA drive might get speeds in excess of 100MB/s, the Pi’s performance is significantly less. [Rusher] uses the Gluster distributed file system and Docker on his Raspberry Pi. He measured write performance to be a sluggish 1MB/s (and the root file system was clocking in at just over 40MB/s). There are an endless number of settings you could tweak, but [Rusher] heuristically picked a few he thought would have an impact. After some experimentation, he managed 5MB/s on Gluster and increased the normal file system to 46 MB/s. In an ambitious and ingenious blend of mechanical construction and the art of dance, [Syuko Kato] and [Vincent Huyghe] from The Bartlett School of Architecture’s Interactive Architecture Lab have designed a robotic system that creates structures from a dancer’s movements that they have christened Fabricating Performance. A camera records the dancer’s movements, which are then analyzed and used to direct an industrial robot arm and an industrial CNC pipe bending machine to construct spatial artifacts. This creates a feedback loop — dance movements create architecture that becomes part of the performance which in turn interacts with the dancer. [Huyghe] suggests an ideal wherein an array of metal manipulating robots would be able to keep up with the movements of the performer and create a unique, fluid, and dynamic experience. This opens up some seriously cool concepts for performance art. [Matt and Jason Tardy], who make up the musical performance duo known as AudioBody, were recently featured on Make: explaining how they put on one of their trademark segments. The most popular portion of their show features color changing tubes of light which the pair spin and fling around not unlike a higher-tech version of the Blue Man Group. While the visuals are pretty slick, the technique behind it is far simpler than most people initially imagine. 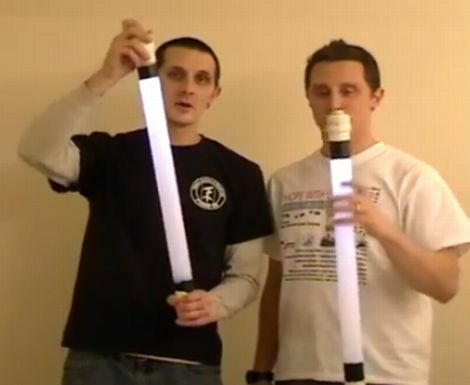 As you can see in video below, the tubes look to be nothing more than simple white lights. As the brothers work through their performance however, the tubes switch from white to blue and back again with a liquid-like transition between the colors. The [Tardys] say that most people peg a microcontroller or other complex electronics as the source of their light wizardry, but the real answer is much simpler. Embedded in the end of each tube is a bright LED flashlight. A sliding blue filter positioned inside the tube provides the silky smooth transition between colors – no fancy electronics required. If you would like to see how they were built, be sure to swing by the AudioBody web site for a how-to presentation by the [Tardys] themselves. This is a first for us. We’ve never heard of an instrument modeled after a pig sty before. The Styharp, built by [Yann Seznec], for [Matthew Herbert] is meant to be a mix between performance and visual art. [Matthew]’s followed a pig from birth to the plate and made an album from the sounds he recorded. The project is called “one pig”. This would explain the reason behind modeling an instrument after a sty. 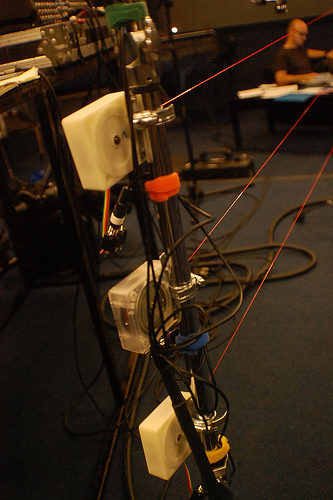 [Yann] started with a Gametrak controller, basically a reel of line connected to a potentiometer. He ended up using 12 of these, which each have 3 outputs. This gave him plenty of ways change the sound during the performance. You can see a little bit of him demoing it after the break.